Carnelian Beaded Cotton Shambhala-style Bracelet, "Peace"
Seven orbs of carnelian are believed to attract life's energy in this Shambhala-style bracelet by India’s Rituu. Meaning "bliss" in Sanskrit, the Shambhala-style bracelet symbolizes tranquility, peace and happiness – the oneness of all according to the Buddhist faith. Rituu expertly knots the cotton bracelet by hand with macramé techniques. 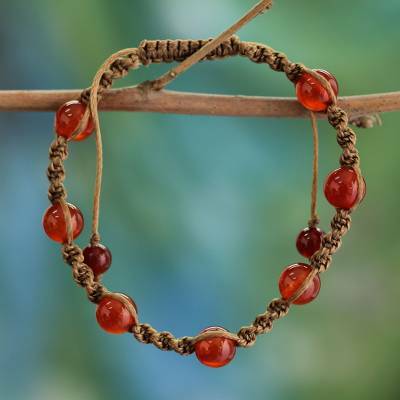 You can find carnelian Shambhala-style bracelet 'Peace' by Rituu Agarwal in jewelry categories such as Bohemian Bracelets, Birthstone Bracelets, Peace Bracelets, Carnelian Bracelets, Cotton Bracelets, Beaded Bracelets and Macrame Bracelets. Enjoy exploring these sections for other Novica treasures. The bracelet is well-made and looks great on my wrist. I get many compliments on it. It's hard to find bracelets that fit my small wrist, but this bracelet fits perfectly. The colours are earthy and warm and the workmanship is stunning. Would make a great gift. I truly love this wonderful work of art. I really would like to get a 5 beads with 2 small beads for my mother. I hope that could be made again and available for her. Thank you for the renewed motivation for me and the positive life force this has given to me. I bought this for a friend and I am so pleased. It is intricate and beautifully made. Will be buying more from this gifted artist!! In the first place, this bracelet was only big enough for a small child to wear. no way would it fit over an adult hand. I put it on my very tiny seven year old granddaughter and it fit perfectly. However, one of the beads fell off in less than an hour and it was ruined. We never even made it out of the house before it fell apart. "how does your light shine"